History proves that the Chinese Chess is the result of constant reinvention and revolution over a long period time. The game spreads so widely and it lives among the Chinese. The 32 gold chess pieces and the gold chess board are all handmade by the skillful goldsmith. The workmanship is so delicate that there is seemingly no joint. It is almost like the reappearance of a legendary treasure from the Palace. The design is unique, yet practical at the same time. It is elegant, exquisite, exclusive and superior. It was said that the Chinese Chess pieces were made in ivories during the ancient time, hence the Chinese call their chess “Ivory Chess” (Xiang-qi). We also believed that the Chinese Chess has been existed since the B.C., an era when China was still divided into small countries. If you try to cast a Chinese Chess set by gold in the traditional way, 32 chess pieces that weight about 1kg will cost you at least RM25 thousand. The millionaires are able to afford it, but the ordinary people can only stare at the chess and sigh. After of experiment and the effort of many goldsmiths and designers, a special casting method is invented. The shell is coated with gold, and the surface is damascened with gold by hand. This method cut the cost drastically but the quality and the texture are better than the traditional method. 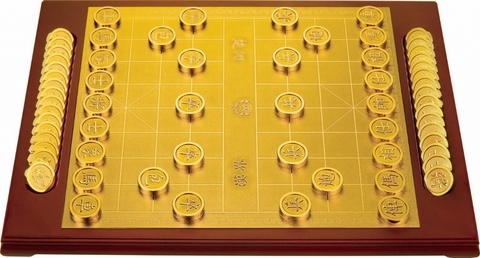 The chess board with the size of 802cm2 is also handmade by 999 gold. Today, the first and ever Gold Chinese Chess is finally born.